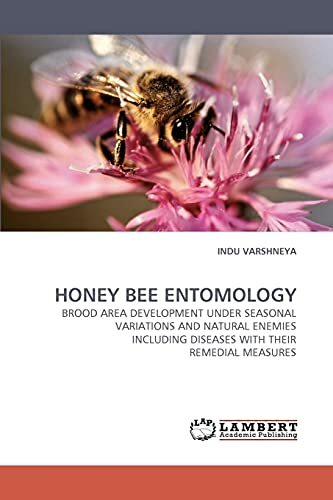 Indu Varshneya offers detailed information represented through texts, graphs, tables, sketches and photographs on brood area development of Honeybee (Apis mellifera) in accordance with seasonal incidences and natural enemies. This covers: Brood area development of A.mellifera in Langstroth hive with different frame strengths; Effect of seasonal variations on brood area development of A.mellifera; Different natural enemies of A.mellifera viz., mites (Tropilaelaps clareae, Neocypholaelaps indica, Varroa jacobsoni), wasps (Vespa tropica haematoides, Vespa orientalis, Polistes hebraeus), moth (Galleria mellonella), bacterial isolates etc. and their impact on brood area development; Measures for optimum development of the brood area, remedial measures for controlling natural enemies and overcome the effect of seasonal variations; Various bacterial isolates found in Honeybees'' larvae. This is going to benefit the masters'' students of Entomology, research scholars in the field of Agriculture Entomology especially on Honey bee and Honey bee pathology. This analytical representation is highly benefited for Apiarists to protect their apiaries from natural enemies and diseases. Indu Varshneya is Ph.D. in Ag. Entomology from G B Pant Univ. of Ag. & Tech. Pantnagar, India and published research work internationally. She is Faculty at C.C.S. Univ. Meerut India and authoress of “Objective Biology” a book of 1600 pages (ISBN No. 978-81-8357-187-6). drindugupta@yahoo.com, +91-9911163933, She is certified & experienced Apiarist.